I am a huge fan of coupons…I try to use at least one each time I go shopping. 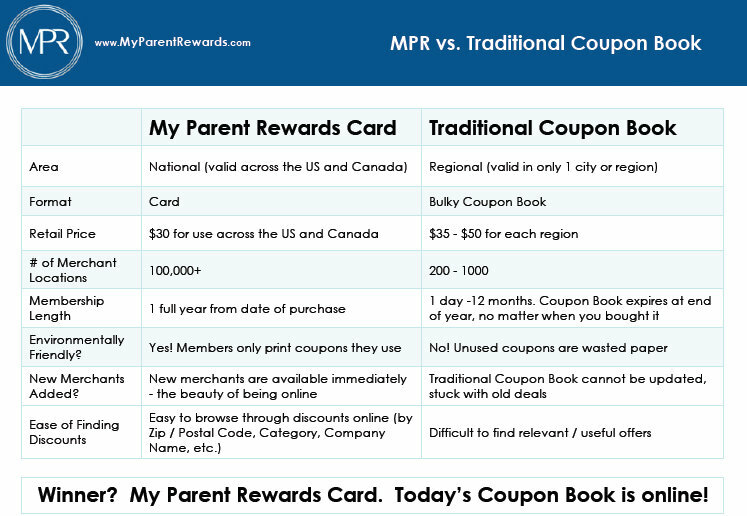 I just discovered something new today – My Parent Rewards Cards. Now I haven’t tried these yet, but the idea is rather intriguing! Normally $20 each, these cards are “everything a coupon book is… but in a CARD!” While I love the coupon books, I also love the idea of having a card small enough to fit in my wallet that does the same thing. It also wastes a lot less paper than the traditional coupon books, because you only print out the coupons that you’re actually going to use! 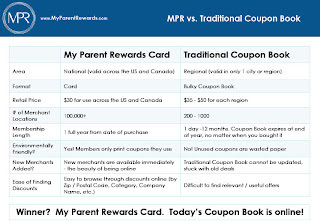 Visit MyParentRewards.com and type in your Zip or Postal Code on the front page to see all of the discounts and special offers available in your area! They range from 2-for-1’s at Restaurants and Golf Courses to to 50% off at Retail Stores, Attractions and more! Would you like to save money and win one of your own? The only compensation received for any review post, is a sample of product. I received a My Parents Reward Card for this review. Compensation never has a bearing on the outcome of a review. 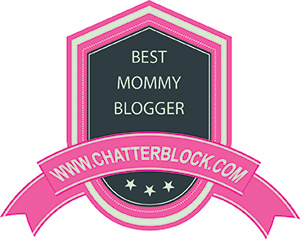 The opinions expressed herein are those of blog author only. I will be receiving a savings card for this post. For further information, please refer to my Acknowledgment Policy. « Clickfree Automatic Backup Review – True Story!